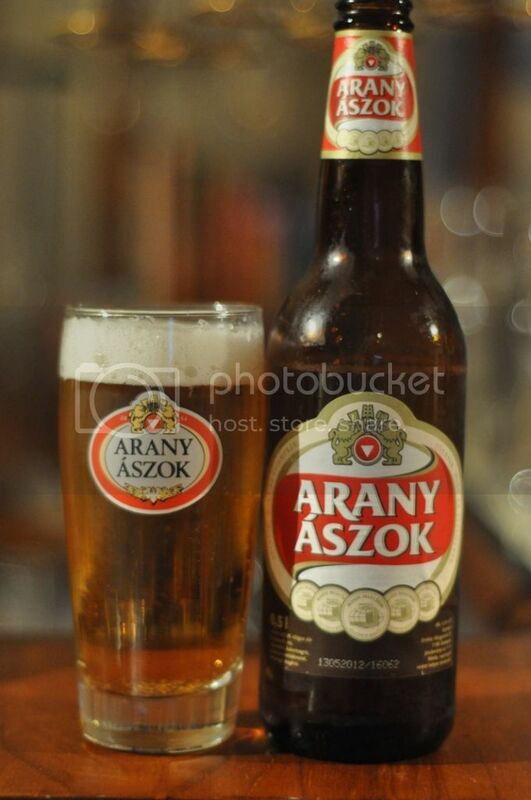 My final beer for this evening is Arany Aszok from Hungary. This has been in the fridge for a couple of weeks but I recently received the glass from my friend Gosia and thought that tonight should be the night to open it. I've had some previous experience with Hungarian beers with both Dreher Classic and Dreher Bak. Arany Aszok is also produced by the Dreher brewery of Budapest, so this will be the third of their beers that I will have sampled. I know nothing about this beer but if it's anything like the other two Hungarian beers I've had, it should be pretty good. Arany Aszok pours a nice golden straw colour with a slightly disappointing off-white head atop. There appears to be adequate carbonation rising to this head, which probably explains the good half centimetre of foam that lasts for the entirety of drinking. There is some lacing of the glass, but not enough to really impress. Initially this beer has more malt than I expected, this fades into the background quite quickly though as some sour grains take over. Thankfully Arany Aszok does have some hops! They are of a flowery variety and provide good bitterness and leave a lovely aftertaste in the mouth. The carbonation in this beer is very fine, by that I mean that there are lots of very small bubbles which feel lovely on the tongue but don't affect the drinkability at all. The beer of Budapest, Arany Aszok, is a much better than average Euro pale lager. It's brilliantly balanced and is clearly made using excellent quality ingredients. I think I need a trip to this part of the world at some point, I love Hungarian food it's delicious and their beer is fantastic as well. This is a lager I can see finding a home in my fridge in the not too distant future. It's really good, I would buy it if you see it!